I'm recently back from a trip to Nepal, a small country between India and China, where cellular service was surprising good and easy to get. Several US carriers claim their phones work there, and they do, but at roaming charges that are at least $1.49US per minute, and more commonly as high as $3US per minute. As has been our recommendation, such as on our Mexico Roaming page, a very economical option has been to buy a local GSM SIM from a foreign cellular dealer and install it in your unlocked GSM phone. But when you get far from home (half way around the globe), your phone needs 900 or 1800 MHz capabilities, and you need to try a little harder to find just a SIM without the complications of buying a whole phone and a plan. 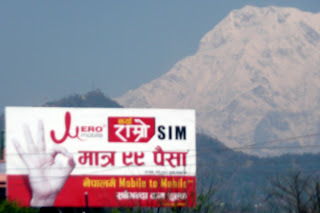 the see the billboard shown on the right, advertising the purchase of a cellular SIM. Most dealers will sell you a SIM (at about $5US) without the normal documentation. However, large refill cards are rare so you either need to have the dealer refill for you, or you need to enter a bunch of codes from very small refill cards. As is normal, incoming calls are free. Calls TO the US were as much as .56US per minute. The local LD stores charge as much as .60US, so cellular is a money-saver, if there are sufficient circuits to make the call. Power outages make this a common problem. But the bigger savings is for local calls where a local SIM gets you a rate of as little as .05US per minute. Who do we call? First, there are the taxi drivers who don't always know where they're going. And there is our Sherpa, to help us carry our baggage and supplies. They all have their own cell phone, often with dual-SIM capabilities, while trekking in the Himalayas. I can carry my own phone, thank you.